New York gets its groove back - and Indian Americans join the party. New York or New Delhi? Where would you be able to watch a world class Marathi play, hear a thought-provoking talk on Satyajit Ray, sit through over 30 movies with a South Asian connection, catch an opera of a Salman Rushdie novel, see a British production of Passage to India and enjoy Bollywood movies on demand on TV? All in the same week, many on the same day! If you guessed New York, you’re right. Indeed, if you have an interest in India-related arts and live in the Big Apple, chances are you are exhausted, ready to drop! But it’s a happy, satiated kind of exhaustion, the kind you feel after you’ve indulged yourself at a huge banquet. You’ve overeaten and wish you could still go back for more, because there are just so many wonderful dishes that you haven’t even tried yet. Just this past month, you could have caught the Tendulkar Theater Festival scattered in different venues across the city or seen diverse films from the Indian Diaspora at the IAAC Film Festival; If you’re an opera fan, you could have had the unique experience of watching Salman Rushdie’s Haroun and the Sea of Stories in opera form by the New York City Opera at the Lincoln Center. Want theater? You would have to choose between Passage to India at the Brooklyn Academy of Music, Sakharam Binder at 59E59 Theater or Bombay Dreams on Broadway. If you wanted an Indian connection in a topical hot play, there was Aasif Mandvi playing in the powerful Guantanomo downtown. Not to mention the scores of plays put on by South Asian theater companies. Want something more Bollywood? You could catch Gurinder Chadha’s latest Bride and Prejudice at not one but two South Asian Film festivals. Want live celebrities? You could have had a rare sighting of Mira Nair, Salman Rushdie, Shashi Tharoor, Shabana Azmi and Madhur Jaffrey all on the same stage at the same time, accessible and chatting with the crowds at the Indian Diaspora Festival. On NPR’s Fresh Air program, they’re chatting about the intricacies of Bollywood music and the mighty Time Warner is actually showing pay per view Bollywood movies! Notably none of these are traditional desi outlets, but rather mainstream efforts or collaborations with the mainstream. A decade ago immigrants would have found it hard to believe that this would come to pass. So what exactly is happening in New York – the city seems to be on speed, with just so many things happening that it’s like a mad, mad exuberant desi wedding procession, with everyone singing and dancing and jumping, all at the same time. Everywhere you turn, you hear the city reverberating with music, song, dance and the spoken word. It’s been said that New York is the center of the world, but for a time, after Sept, 11, the city seemed to lose that title. There seemed to be barricades, mental and physical, everywhere and the smell of fear pervaded everything. The city that never sleeps seemed to be awake more in shock and horror. Slowly life resumed, but the arts scene seemed to have been dealt a mortal blow, especially ethnic projects. Funding was cut, programs were put on hold. Yes, for a while, after 9/11, New York seemed to be ripped right out of Haroun and the Sea of Stories. It looked like the sad, sad city of Alifbay, drained of stories, drained of color, held hostage by the arch villain Khattam-shud, the Prince of Silence, the foe of free speech. The towers fell and with it the self-confidence and bravado of New York. If you had a South Asian face or a strange sounding name, if you wore a turban or spoke a different tongue, you had little right to be here, leave alone flaunt your strange arts and exotic culture in the face of the majority population. 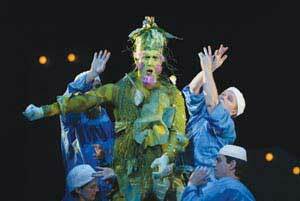 Indeed, the opera of Haroun and the Sea of Stories by the NY City Opera was supposed to have been developed two years ago, but after the 9/11 attacks, the public funding just dried up and the production had to be canceled. For a time nobody could even guess if the money would ever come back and it’s taken three years to reconstruct what existed before. So it was that Rushdie’s magical Haroun and the Sea of Stories was finally being seen by opera buffs on the grand stage of the New York State Theater at the Lincoln Center, with an overwhelming response rarely accorded a new opera. The auditorium was filled with a sea of faces of every nationality and the applause was deafening. In a changed world, everyone could identify with it. While advocates who deal with civil liberties will tell you the city has still a long way to go, the arts seem to be reviving. And in that renewal, if you listen carefully, there seems to be an unmistakable South Asian beat to the wonderful cacophony of New York, a distinct taal that is Indian has been added to the rhythms of the city. Arts from South Asia seem to be flourishing at museums, theaters and galleries in New York and there’s something new to savor every month. The Brooklyn Academy of Music, which had earlier shown Peter Brooks’ The Mahabharata, recently showcased a British production of E.M. Forster’s A Passage to India, a story that acquires added relevance in these difficult times when living with different cultures becomes an everyday challenge. Joseph V. Melillo, Artistic Director of BAM, says, “We want BAM to be NYC’s global center, so I travel a lot internationally, looking to bring work to New York City.” In fact, BAM”s Next Wave Festival is dedicated to encouraging new works and collaborations between artists. 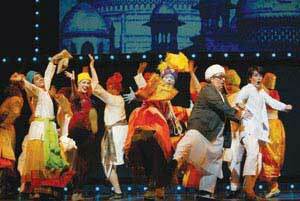 Passage to India, which was shown at The New Wave Festival received a rousing reception at the 2000 seat Howard Gilman Opera House was full, and Melillo agrees that New York is definitely getting back on its feet. “In this city specifically I think there is a curiosity and a sincere interest in the art and culture of India,” he says. “You come to New York City because you want intellectual challenges and if you’re intellectually curious then you’ll also have a great appreciation of the cultures and the art of that culture. Vijay Tendulkar is one of India’s greatest playwrights and the Tendulkar Theater Festival organized by Indo-American Arts Council brought in readings, workshops, film screenings and discussions by this celebrated playwright in venues across New York. 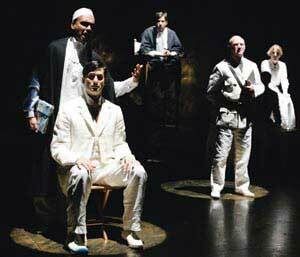 The Play Company, a New York City not-for-profit theater, showcased his powerful play, Sakharam Binder, which was banned in India after its initial opening. So how did The Play Company, which links American theater with world theater, hear about a Marathi play revolving around an obscure bookbinder in Mumbai? The Festival was the idea of Aroon Shivdasani, Director of IAAC, who knew Tendulkar and invited representatives of all the South Asian companies and several other mainstream companies like the Lark, the Play Company, the Martin Segal Center, the Queens Museum, CUNY Graduate Center to a lunch and brainstorming session. Kate Loewald, founding producer of The Play Company, was amazed by the relevance of Sakharam Binder to contemporary audiences for even though it’s rooted in a very specific place, the issues about morality, social pressures, religious differences and relations between man and woman resonate even today. The play received great reviews. In fact, the response has been so encouraging that Loewald is exploring the possibilities of taking this powerful production, which stars Bernard White, Sarita Choudhury and Anna George, to other cities, to Britain and perhaps even to India! 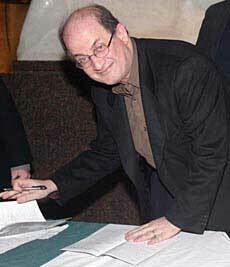 Last year Salman Rushdie’s Midnight’s Children was presented by the Royal Shakespeare Company at the Apollo Theater in Harlem and was hugely successful with workshops and lectures at Columbia University. The truth is audiences are becoming more open to lives different from their own. And it’s happening in almost every aspect of the arts, be it theater or films. Gitesh Pandya, who heads BoxofficeGuru.com, is a media consultant and box office analyst for CNN Financial News, besides being the producer of the film American Desi. Moving in several different circles, desi and mainstream, he has seen the mood change in the city over the last few years. Indeed, the mainstream media is also paying more attention to Indian theater and Bollywood films, which earlier had been on the margins. Out and out Bollywood films like Bhagat Singh, Koi Mil Gaya and the latest, hottest Veer Zara have all been reviewed in The New York Times, even though some of them ran at traditional Indian outlets. 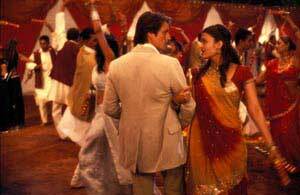 Just this past month The New York Times ran reviews of Bride and Prejudice and gushed over Aishwarya Rai, comparing her to Liz Taylor and anointing her as among the top five talents to watch this holiday season. Another factor is that big studios are also taking an interest in promoting films such as Monsoon Wedding or Bride and Prejudice, which will be opening in February in 400 theaters across the country. The next step will probably be when they start distributing mainstream Bollywood films, realizing they are the goose that lay the golden eggs. Consider Veer-Zara: It ranked #15 at the North-American box-office last weekend with a $843,010 gross! And indeed, that brings us to the other reason for New York’s resurgence as a great place to experience the South Asian art scene – its huge and dynamic desi population. The New York metro is the largest populations in North America and South Asians are especially concentrated in it. New York events, whether it’s a one night show or a play or film which runs for a long time, draw from a large audience, which has historically been steeped in the arts. This concentration has a lot to do with the vast audiences that come out and because of that the people who are putting on these programs are aiming higher. As Pandya points out, ” The South Asian art community is at the point of going from the minor leagues to the major leagues. We’ve done a lot of work on the smaller level in the smaller venues. The hope, of course, is that people who are not South Asian will also come out to the event so organizers are trying out new marketing techniques to reach out to a larger audience that may be interested in a certain type of play or film or certain type of music. Interesting collaborations are also occurring, enabling Indian Americans to bring their homeland culture to the mainstream outlets. Bollywood On Demand Video On Demand (BODVOD) is a new programming service that will deliver South Asian movie and television content through on-demand platforms. BODVOD is a partnership of NY-based  MEDIA and Schramm Sports & Entertainment. The recently concluded IAAC Film Festival screened films, ranging from Bandhak, a film made by Indian Americans in New Jersey and New York, addressing racism after 9/11, to Sacrifice, which tells the story of an Indo-Guyanese family struggling to fit into a new world. For many young Indian American filmmakers, New York has been a fertile nurturing ground with its many film schools, its arts communities and its wonderful audiences that are willing to wait in line, endure subtitles and are happy to be transported into cultures not their own. The result has been not only feature films, but hundreds of documentaries from Indian American filmmakers, a cinematic essay of what they believe. 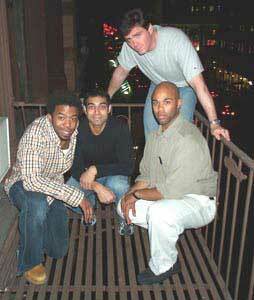 Many of the stories are about here and now, about racism and the aftermath of 9/11. Indian Americans artists, having found their place in the American landscape, express their political and social views. There is Whose Children are These? – a film by NY social activist Theresa Thanjan about the after-effects of 9/11 on the lives of three Muslim youths impacted by Special Registration. Then there is Reinventing the Taliban, a film about the rise of radical Islamic fundamentalism in Pakistan by New York filmmaker Sharmeen Obaid, made with initial support from New York Times TV. As South Asian talent continues to grow and multiply, filmmakers are taking on mainstream projects and collaborating with other filmmakers, truly becoming a part of New York’s energetic arts world. Dancing on Mother Earth, a PBS documentary, directed by Jim Virga and produced and edited by Tula Goenka, was partially funded by a grant from Native American Public Telecommunications and with in kind contributions from the S.I. Newhouse School of Public Communications at Syracuse University. One of anything is rarely enough for frenetic New York. Hardly is one South Asian film festival over that another is opening. The South Asian International Film Festival, a collaboration between Time Warner and SANA, the South Asian Networking Association, is starting with a bang with Bride and Prejudice at the Ziegfeld Theater. Shwaas, and this year’s Oscar entry from India will be the closing film. All in all, 38 of the latest films and documentaries will be shown at the Clearview West Theater and at the newly opened South Asian themed Rubin Museum of Art. And so even though the South Asian population lives under the shadow of the Patriot Act and its assault on civil liberties, the art world is alive and well. While social activists know that the state of the country is far from perfect, it is the artists and the writers and poets who are putting their dissatisfactions and their beliefs out in the open with their work. In small ways too South Asians are getting their voices heard, and what better place than New York? There is certainly a lot of empathy here for different lives and cultures. Rehana and Rohi Mirza are two sisters who formed a theater company, Desipina along with Ashok Sinha to produce their first project Barriers, a pan-Asian family drama that deals with the loss, as well as the backlash and prejudice towards South Asians after the World Trade Center tragedy. This production was funded in part by the Manhattan Community Arts Fund/New York City Department of Cultural Affairs, administered by the Lower Manhattan Cultural Council. Interestingly, their new play Broke is about New York lives, four mechanics in an auto shop in Queens. Only one of the actors is Sri Lankan, the other characters are Italian and African-American, and by being so particular yet universal, the play is attracting audiences that are very diverse. Indeed, it’s an example of how South Asians can produce theater without making the desi experience always the central part of a story and in that way, reaching out to the larger audiences out there.